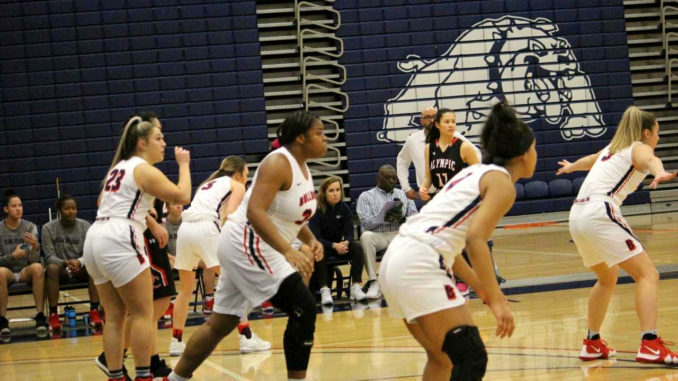 In-conference play for the Northwest Athletic Conference continues to heat up, and the Bellevue College women’s basketball team is top three in the North Region thus far. Just behind Olympic, BC’s 5-2 in-conference record ties them for second with Skagit Valley, who they face in an upcoming match on Feb. 9. Bellevue continues to be a threat with their top ranked defense in the NWAC. Since in-conference play started, Bellevue has ranked second in opponents’ field goal percentage, third in blocks per game at 4.4, fifth in the opponents’ overall field goal percentage and sixth in points allowed per game. Freshman Amanda Luckett currently leads the effort, averaging a team-best 8.7 rebounds per game and 1.8 blocks per game. Luckett also leads the team in points per game with 11.6, while freshmen Natalie Amos and Jahdai Alcombrack round out the top three in this category, with 10.9 and 10 points per game respectively. It’s also worthwhile to note that Luckett contributed to a team-best 51 field goal percentage, and her block total of 34 this season is second in the entire NWAC. A roster filled with freshmen, Bellevue is putting together an impressive season, as they sit on a four-game win streak. The most notable game in this stretch was their 52-46 win over top seeded Olympic on Jan. 26. In fact, there was no point in which Olympic was in the lead. Bellevue played lights out on defense, holding Olympic to 24.2 percent from the field, and 23.5 percent from the three-point line. Alcombrack led the team in scoring with 21, while Luckett put together an impressive line of 10 points, 11 rebounds, three steals and four blocks. Of Alcombrack’s 21 points, 10 actually came from the free throw line. Other notable performances with the Bulldogs’ recent win streak include two big games by Amos and Luckett, with their 84-71 win over Everett on Jan. 30. Amos put up 32 points, supplemented by nine rebounds, six assists and five steals, on an impressive 15-18 from the field. Luckett scored 21 points of her own, with a team-leading 16 rebounds as well. In Bellevue’s Jan. 23 win over Edmonds, Luckett continued her streak of double-doubles with 10 points and 10 rebounds. Amos scored 16 points with nine rebounds of her own, and Alcombrack scored 11 points with five assists on top of that. The origin of BC’s win streak dates back to a 78-58 victory over a struggling Shoreline team. Four of the starting five scored 10 or more points, with Luckett, Amos, Alcombrack and sophomore Sidney Schultz scoring 19, 10, 10 and 13 points respectively. This was the one game in the win streak where Luckett did not get a double-double, although she did net nine rebounds and five blocks. Amos also managed six rebounds, six assists and five steals, while Alcombrack was just one assist from getting a triple-double in the game. Her final line included 10 rebounds, nine assists and three steals. Bellevue will likely look to continue their impressive run on Feb. 6 against Peninsula at home, followed by a must-win game against Skagit Valley. It looks like the Bulldogs have a playoff spot in the bag, but I don’t think that will stop them from reaching the highest they can.